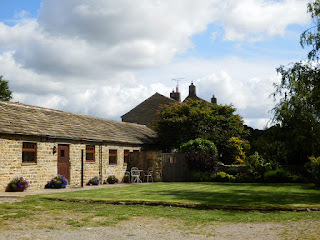 The Calf Pens offers self catering accommodation less than 2 miles from Masham at High Burton in North Yorkshire. This charming cottage is accessed along a ¾ mile track and is a great base for exploring Herriot Country. Sympathetically converted to a high standard, this is a peaceful and comfortable cottage, all on ground floor level. 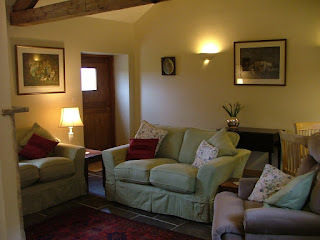 The cottage has underfloor heating and has been decorated and equipped to the highest standard. It has two double two bedrooms, with zip and link beds in each (the cottage can sleep 4 people, either with 2 double beds or 4 singles). Outside there is a paved area with chairs and tables in the summer. There is a lawned area in front and ample parking adjacent to the cottage. The holiday cottage drive is on the Tour de France Route, so for cyclists who want to ‘cycle the route’, The Calf Pens is an excellent place to stay. The market town of Marsham is easily reached where there you will find all local amenities. This part of North Yorkshire is a walker’s paradise. Pretty riverside walks can be enjoyed just minutes from the doorstep and the area has excellent opportunities for bird watching, there is a wetlands conservation area just a 5 minute walk away.